The comet C2013R1 (Lovejoy) was discovered on September 9th 2013 by the Australian hobby astronomer Terry Lovejoy. 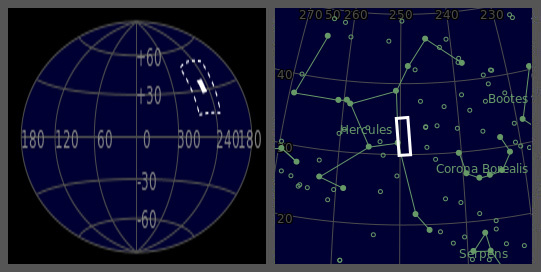 At the time of discovery the 14 mag comet was in the constellation of Monoceros near to the border with Orion. Here the comet is photographed on the night of December 15th between 05:00 and 06:00 LT ( 03:00 – 04:00 UT). This is a four panel mosaic, each panel is one 1 min LRGB combination in bin 2x2. Due to the fast movement of the structures in the comet's tail no stacking was applicable, hence the image is pretty noisy (only one LRGB combination per panel). Other information can be found in the image's details table below.